While we’re in the thick of summer, it’s hard to think about preparing for the crisp air of fall and cold of winter. But as the Starks say, “Winter is coming.” Take advantage of these longer days by getting your home ready for the rain and snow to come. We’ve put together a handy checklist to help you knock out all the tasks that will help you sail through the colder months. We understand you’re busy. 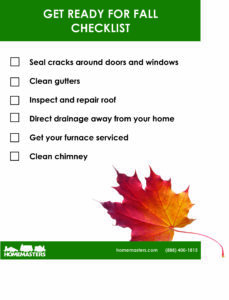 Let the experts at HOMEMASTERS help you knock out your checklist. Call (888) 400-1815 to schedule your free estimate.